With a wide variety of courses and programmes and payments terms for each, Conde Nast College welcomes national and international students to their world renowned courses. They use HEIApply to provide an immaculate applicant journey tailored automatically to the aspirations of the the applicant, with embedded payment workflows and financial reporting we have significantly reduced the manual workload of the small admissions team. You are an applicant from anywhere in the world and have found a course at the right level with a start date to suit you. You can register, upload documents, submit your application form, arrange your interview, receive and accept an offer, pay a deposit, arrange to pay Course Fees, complete pre-enrolment tasks and forms… all within Conde Nast’s seamless Applicant Portal powered by HEIApply. You can choose to see the public website, or go direct to their HEIApply Applicant Portal. Please do not apply. Conde Nast needed a solution that allowed them to take full payments for short courses as part of the booking process, as well as deposits, instalments and full payments for long courses ONLY after the applicant had accepted an offer from the College. HEIApply is able to provide for these scenarios, and many more to match. With the fully flexible payment methods, payment types, and controls over deposits, instalments and full payments Conde Nast are totally in control. Their configuration includes setting up and embedding their secure payment gateway with major payment solutions provider Worldpay. 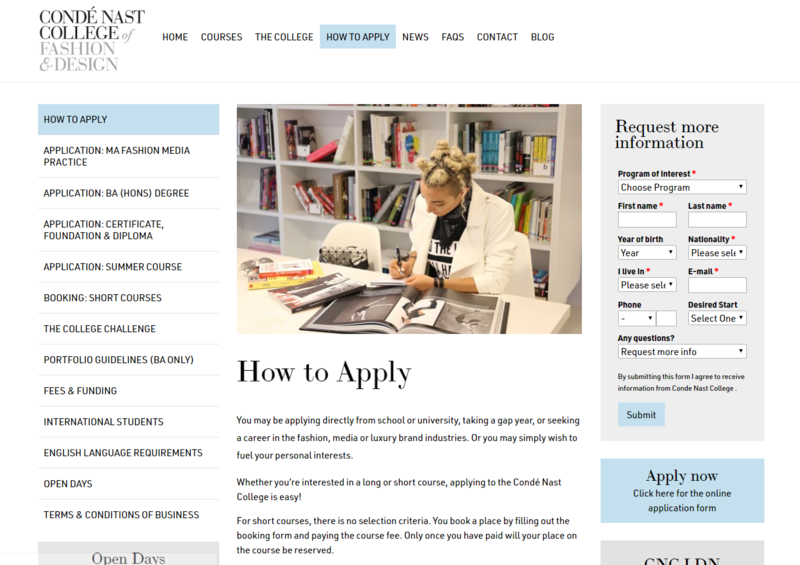 Conde Nast College not only has courses that require a full application form, which is submitted for review, and decisions are made as to whether to make an offer to the applicant, but they ALSO have Short Courses that if applicants pay for a place then you are immediately confirmed as having "booked and paid"! Therefore Conde Nast needed a solution that provided a responsive applicant journey depending on the choices of the applicant. 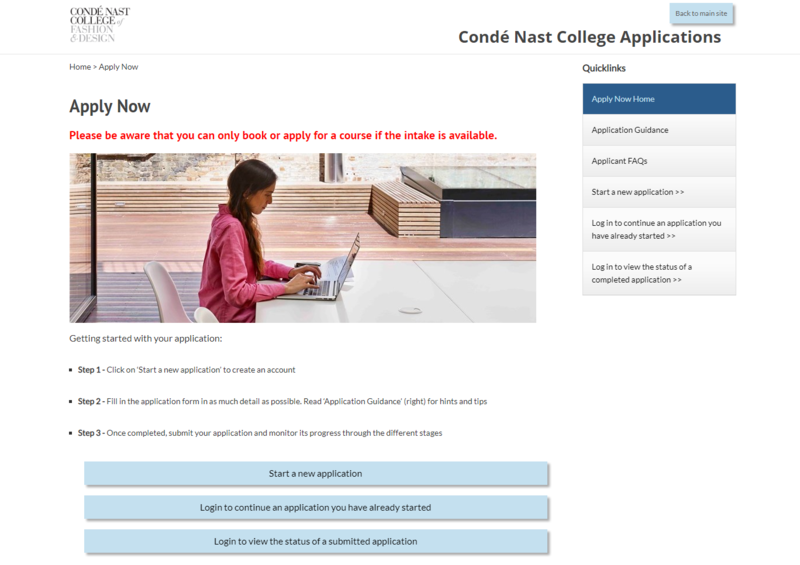 Conde Nast College had previously run online admissions through a system that was no longer fit for purpose. With cohorts of existing applicants part way through applying, some having accepted an offer and started making deposit and instalment payments, the data needed careful conditioning to prepare it for import into HEIApply. We were able to do this to the exact requirements of mapping legacy systems with new data tables. HEIApply embdedded Conde Nast College secure payment gateway into their Applicant Portal, and opened up Administration tools to help them manage payments, invoices, credit notes. HEIApply allow applicants to select Short Courses where they pay as part of the booking process. Conde Nast run as many Short Courses through HEIApply as they like! HEIApply understood the need for the Applicant Portal to reflect the brand identity and brand ethos of Conde Nast.